Congratulations to Luke Shearer (S4) on his continued success with the bagpipes. 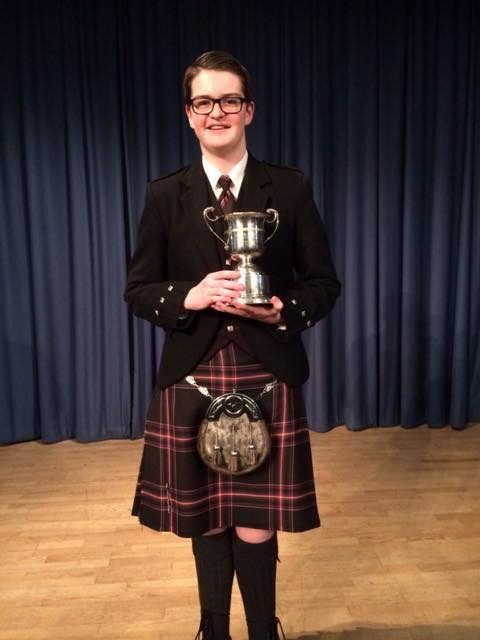 Luke, who has already achieved success at the World Pipe Band Championships last summer, has now won the National Piobaireachd (under 18’s) that took place in the National Piping Centre. Luke was also placed in the Jig, March and Reel categories. Thursday March 3rd is World Book Day and, to mark this event, all pupils in S1 will have the opportunity to participate in a quiz organised by the school librarian with each pupil receiving a book in return. On Wednesday March 8th, schools from across Lanarkshire will gather at Kilsyth Academy to take part in the annual Rotary Technology tournament. Working in teams, pupils will be given a problem to solve and provided with a limited selection of resources to encourage creative approaches to successfully achieving the specified aims. We look forward to welcoming participating Schools and pupil’s to Kilsyth. There will be an information evening for parents of S2 pupils on Monday 6 March 2017 starting at 6.30pm regarding the upcoming curriculum personalisation for pupils moving into S3. We will give you information regarding the process and support available for young people and you will have the opportunity to ask any questions. Pupils will also receive a presentation regarding this process on Thursday 2 March. We look forward to seeing as many parents as possible. Parents and pupils in years S2 through to S6 are invited to attend our Careers Fair on Thursday 6 March 2017. This will take place in the school café and there will be a number of employers, colleges and universities in attendance on the evening to provide information and answer any questions. This is a great opportunity to find out more about the different career options available to you upon leaving school or to help with your subject choices for options while you are here. The next meeting of the Parent Council takes place on Thursday 2 March 2017 at 7.00pm in the school. Pupils in s4 and S5 are reminded that the deadline for returning senior options forms is Friday 10 March 2017. Mr Orrock has now taken up post as the new Head Teacher of Kilsyth Academy. In his first few days he has addressed both staff and pupils and a letter of introduction will follow soon to parents. Kilsyth Academy held their annual Cross Country Championships last week with over seventy athletes competing in either the junior or senior events. This event also doubles up as one of our inter-house events which led to increased competition for every place in the field. Furthermore the organisation and management of this event is led by our Sports Leaders and is an integral part of their course, allowing them to put their impressive leadership skills into action. Junior Girls Champion; Hayley Conroy, Silver, Robyn Stark and Bronze Sarah Bateman. Senior Boys Champion; Fraser Gallacher, Silver, Scott Lilburn and Bronze Ryan Barr. Senior Girls Champion; Jessica Curle who successfully retained the trophy from last year, Silver Rebecca Love and Bronze Rachel Thomson. House Competition. Junior Trophy; Balmalloch – 122 points Senior Trophy; Antonine – 88 points. All athletes who finished in the top ten in the individual competition, will now represent the school at the North Lanarkshire Championships in March. Senior tracking reports will be issued to pupils and parents this week. Reports for pupils in S5/6 will be issued on Tuesday 21/2/17 with S4 reports being issued on Wednesday 22/2/17. Planning is currently underway for our annual Easter School to support senior pupils preparing to sit SQA exams in the up-coming diet. This will take place from Monday 3 April until Thursday 6 April with pupils currently being consulted on likely participation to allow us to finalise our programme. This is a further excellent opportunity for pupils to receive specific support or indeed, an opportunity for private study knowing that support is available if required and, as such we would strongly recommend pupils in S4,5 & 6 consider taking part if available. There will be an information evening on Monday 6 March for parents of pupils currently in S2 to provide information about the upcoming curriculum personalisation process. Further information will follow in due course.